The perennial favorite for fish on the Peninsula. : In 1996, Roy’s opened its first mainland location in Pebble Beach, and it has aged gracefully. You’ll feel as casually-elegant as the dining room, sitting here looking out at the fine view of the Pacific. Embodying the Roy’s Hawaiian-fusion way, fish is fresh and flavorful and striking sauces show off Euro-technique. Find Roy’s signature dishes alongside Pebble Beach originals. Snack and socialize at the sushi bar, or opt to take your Hawaiian dragon roll outside on the patio. 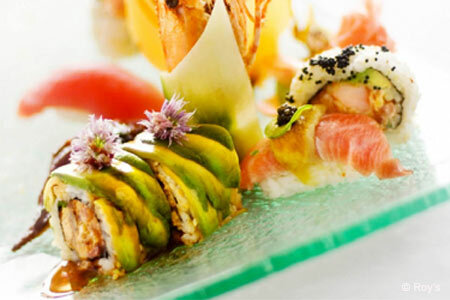 Layers of sliced avocado keep the tempura shrimp, papaya, eel and macadamia nuts intact. Evenings are swanky. So is the Japanese-style misoyaki butterfish, and the tosaka-wasabi-crusted Hawaiian swordfish. If you’re like us, the difficulty is in the choosing; lucky there’s a patient waitstaff. Arm your table with extra forks, then blast your way through a wedge of banana-macadamia nut pie, layered in cream, sponge cake, bananas and a chocolate-cookie crust. Sip specialty coffee drinks aptly named after the area. There’s the Fog Lifter and the Bagpiper (after the real one who plays at Spanish Bay).